Hello everyone: The StampInkPaper challenge has a great sketch by Sandy that is just perfect for this sweet image of a Fairy swinging from a Cherry branch loaded by plump, juicy cherries. This image belongs to the brand new Stampin Up! set called Fairy Celebration. As soon as I laid eyes on this set, I couldn't wait to order it. Fairies have been always a source of fascination and wonder for me, all little girls dream of Fairies, we start believing in them when we used to put our little baby teeth under our pillow for the Tooth Fairy to come and collect them and give us a shiny little coin, maybe it was a shiny silver Dollar or a shiny silver Peso and finding this coins in the mornings, was simply amazing. I used to write teeny, tiny notes to my grandkids when they were little, I loved the look on their faces when they came to see us and tell us they got a visit from the Tooth Fairy. Here is my card. I stamped this sweet image onto Canson water color paper with Stazon Jet Black ink and colored it with SU markers and the aqua painter. then, I sponged the sky with distress ink. I stamped the cherries and her leafy skirt onto some scraps of Strathmore 90lb. water color paper because I wanted to fussy cut them to give it some dimension, I rubbed my bigger stylus in the back to "plump" them up a bit. I also used the Fairy Dust stamp from the set with Versamark ink and heat embossed it with gold glitter embossing powder. Looks like she's shaking all of this golden Fairy Dust all over the place. The pattern paper is from Lili of the Valley, I die cut the image and the frame using the retired Labels Collection framelits set and did a bit of paper piercing with the matching mat, I love the way it looks. Here is a picture of the finished inside of my card, the sentiment is from the Fairy set, the butterfly is from another gorgeous Stampin Up! set called Watercolor Wings. I stamped the Fairy Dust stamp from the set above and below the sentiment with Versamark ink and heat embossed it with Iridescent embossing powder, hope you can see it in this picture. Hello everyone: Well, it's time to have some fun with a new challenge here at the RETRO RUBBER challenge blog, where we encourage you to go dig deep into your stash of old stamp sets, the ones you bought over a year ago or more and, sadly have been neglected, a little or a lot by you because of the new stuff that we can't seem to stop buying. You know what I mean, right? So go ahead and give some well deserved love and ink to a stamp older than a year and, in the process, join us in this week's challenge where we are asking you to use BRADS OR EYELETS, you know? this little metallic thingies that kind of been pushed aside by the new Enamel Dots, sheeesh!! Here is my card, made with some of the most adorable little trucks around from the retired Stampin Up! set called "I Dig You", that came out in the 2011-2012 SU Catalog. Now, do you agree that this trucks are just super cute? I can't tell you how many little boy cards I've made with this set, each time I create a different scenario but the one I love the most is this one, where the trucks are digging for presents, just so darn sweet. The images were stamped using SU inks that I'm surprised still work great. After stamping the trucks a couple of times to get the color even, I heat embossed them also twice with clear embossing powder just to get them to shine like they just got a good wash. I stamped each truck and their wheels separately and fussy cut them, which is not hard at all since they have straight lines. Then I created the mounds of "dirt" and "rocks" by embossing some brown card stock with a snowflake embossing folder sponging some Baked Brown Sugar on the torn edges. The little gifts and the sentiment are from the same set, I just arranged them to look like they are being dug up, LOL!! Now, our challenge is to use Brads so I went to town with a bunch of them, I even found some mini silver brads in a little box inside the brads drawer, that were just perfect for the orange plow, lucky, lucky me!!! All of this images are from the "I Dig You" set except for the "Wish Big", which belongs to a retired Flourishes set called "Pinwheels and Popcicles". This is the RETRO RUBBER banner that inspired my card. I hope you come and play with this week's challenge, remember to use stamps older than one year and brads or eyelets, I'm sure you have some in the bottom of your embellishment box or drawer, put them to good use and create a card to share in the gallery, we can't wait to see it!!! I hope you like my card, if you have any questions, please leave me a comment, I love reading them and I will always respond. Now, go and stop by the the rest of the Design Team's blogs over at the Retro Rubber blog, for some more inspiration. This challenge will run until July 15th. 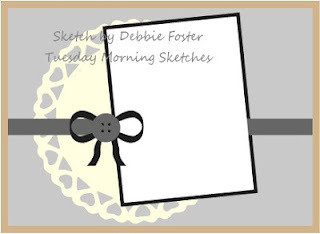 Hello everyone and welcome to another fun challenge at SHOPPING OUR STASH, this week we want you to join us creating cards with WORD BUBBLES. I'm lucky I have only 2 little word bubble dies.....Yes my friends, only 2!!!!! but they were enough for me and this card I made with one of my favorite stamps from Penny Black called Best of Luck! !, this chickens are just to funny. I stamped this image onto a panel of Canson water color paper with Stazon Jet Black ink and colored it with SU markers and the aqua painter, sponged the grass and sky with distress inks, easy peasy, right? Ok now, the word bubbles were no trouble to die cut but, I had no idea what to write in them, they are small and I didn't have any sentiments small enough to fit or to make sense of this kind of precarious situation this chickens are facing so, I thought and thought and just arrived a the conclusion that I was going to have to really SHOP MY STASH and find some stamp sets with sentiments I could use to write inside the word bubbles something funny and related to the image. Ok, the words on the big word bubble are stamped with 3 different sets. The word "Blow" is from a retired Flourishes set called "Pinwheels and Popsicles" the word "Candles" is from a retired SU set called "Whimsical Words", the words "up the" are from a retired SU set called "Up, Up and Away", the word "now" is from a set with very narrow letters that are really hard to stamp but I managed to form the word after a few attempts and the word "Yikes" I wrote it myself, there is nothing else this little baby chicken could actually say. So, what do you think, eh? when you are in a pickle, and believe me, I was!! this is really a great way to pull out your old sets and combine a few of them to create something really nice. I did a lot of masking but, in the end, it was all so worth it. Here I actually used the complete sentiment with the word "Candles", the cake is from another retired SU set called "A Slice of Life". I hope you join us this week for this fun challenge at Shopping Our Stash, I certainly did just that to be able to put together this fun Birthday card. Hello dear friends: This card is not for a challenge today, this card is to wish you and your family a very happy and safe 4th. of July!!!!! As an immigrant and for the past 15 years, a proud American Citizen, I feel fortunate and grateful to live in this wonderful land of opportunity, where hard work is rewarded and Freedom is cherished, regardless of where you came from. So, today I salute my adoptive Country and all of you, my friends, God Bless the United States of America. A picture of the finished inside of my card. Big hugs and best wishes from Maria. Hello dear friends: I have a card to share that has been in the making for about a week but for some weird reason, I put it in my box of "to do" images and just plain forgot it. But today, after my morning post (you can see it HERE if you'd like), I suddenly remember it, maybe because of the beach theme?? I don't know but my initial intention was to submit it to the CASology challenge that has a CUE CARD with the word ROW, I'm glad there is still time to enter this challenge, sheeesh!! that's what happens when you're approaching 65 fast!! and have a ton of stuff, grandkid related, to do, I'm not complaining, I love having the kiddos around so, with no further delay, here is my card. This row of shells are from the retired Flourishes set "Seaside Life" which I also used for my previous card, I love this gorgeous images. Using my MISTI, I placed the stamps in different directions in a row and then, stamped them with Versafine Onix Black ink and heat embossed them with clear embossing powder, then colored them with my SU markers and the aqua painter. The sentiment is from the set. Easy peasy, makes me want to go to the beach!! The sentiment is from the set Sassy Succulents from Power Poppy, the shells from the Flourishes set. 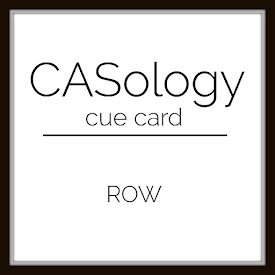 Here is the CUE CARD from CASology that inspired my card. Hello everyone: Summer is well on it's way and hopefully all of you, are enjoying the warm days and nights, maybe some of you are vacationing on a beautiful beach, getting a much needed tan (safely, please!!) sipping something delicious and simply chilling out. 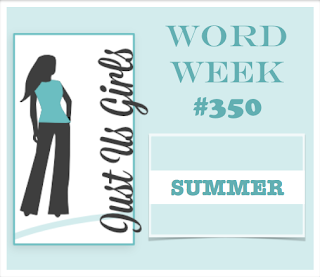 Over at Just Us Girls the word for the week is SUMMER so, I took the sketch from Tuesday Morning Sketches and created this card. This image is from a set called Best Day Ever from Power Poppy. I stamped the image onto Strathmore 90lb. water color paper with Versafine Onix Black ink and heat embossed it with clear embossing powder then, colored it with SU markers and the aqua painter. I crated my own pattern paper by stamping the wood grain image from Hero Arts with Dove Gray Stazon Ink and then, stamping some of the beautiful images from a retired Flourishes set called "Seaside Life", I just love all of this gorgeous sea shells!! I stamped two of them onto some scraps of water color paper, colored them and fussy cut them, I added some dimension with the big stylus, they really look so pretty. I also added some Crystal Effects to the sun glasses. The sentiment is from the Best Day Ever set and the shells from the Seaside Life set.